Hedra has just caused me to say, out loud, "WHY didn't I think of this when my kids were babies?" If you're one of the lucky parents whose infant has those ghastly blowout diapers where the poop shoots up their back, take advantage of the crossover fold shoulders on most infant onesies. Take the shirt off DOWNWARDS rather than over the head. The crossover fold on the shoulders makes it possible to put the shirt on over their big heads, and ALSO to take it off over their big bellies (and a diaper). No more poop in the hair, or contortions and rolling up of poopy shirt to avoid the poop in the hair thing. Only have to rinse off the bottom 3/4 of the baby, instead of the whole baby. Good all around! This may be a duh to a lot of folks, but it was a huge lightbulb moment for me. Yes, indeed. That's the funny thing about parent hacks — one person's "no-duh" can be another person's life changer (or, at least, moment changer). 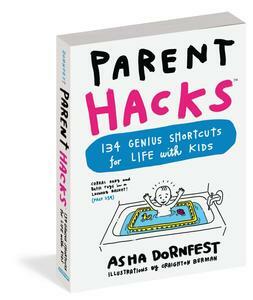 Got a parent hack? Submit it here. Good idea! Here’s my addition: I usually lay the baby in the bathtub to change *those* diapers. No nasty changing pad to deal with afterwards, and if the baby squirms and spreads the mess it’s no big deal. I so don’t miss all that. There are perks to having them grow up. We gave away the diaper table last weekend! And this, folks, is why Parent Hacks is my first stop every day. Brilliant. Another addition: Pull everything off with the (pre-crawling, or heavily constrained crawling) pooper laying belly-down. Less smearing, easy wiping! Dang it, needed this one earlier today! 🙂 Not going to make that mistake again. Brilliant. Oh oh oh! Now you tell me this! My youngest is 20 months, so hopefully I will never have to use this hack, but I will spread it to all my friends! Yes, I do feel kinda “duh!” – I have been changing dipes for almost 10 years, and it never occurred to me!!! I have three grown kids and a two year old grandson, and I never thought of that–duh?! Great hack! Wish I had known that the ONE time I went out without a spare outfit. (I know, I know…bad mommy….) I had pulled the outfit up and had poop in her hair, on her coat, in her tights, everywhere. We went shopping shortly after that. I read this and then put it into use later the same day! My only addition is that if your baby is the poop-exploding type make sure your onesies are a little too big rather than a little too small. Makes clean up a lot easier and quicker. And remember kids, if your baby is blowing out their diapers, it’s probably time to move up to the next size!! Brilliant! I, too, lie the baby on the belly for these lovely diaper changes. I will be using this hack for awhile now that we have twins! I’ve never tried this, but I will share our own hack. I roll the messy bottom of the onesie up over itself, just like rolling up your sleeves or pant legs, so all the poop is contained inside the rolled-up part of the onesie – then remove the onesie over the head as normal. This works really well once they can sit up. I think the article’s method would work better than mine for the early months, though – if only I’d known! Actually, hedra, its the friction of the cloth in cloth diapers that prevents the blowout – I’ve never had one where I’ve needed to change the whole outfit at all! Or then there’s a friend’s suggestion – just use cheap Gerber onesies, and cut them off if need be. Especially when you know that stain is never getting out of the clothing. Not my cup o’ tea, but thought I’d share. I am ashamed to admit that this (pulling the onesie down)never even occurred to me with my first child. With baby #2 I felt like light was shining down from heaven when I realized that they must make the crossover neck for just this reason!